Having done an in-depth study of the four toy spaniels for a judging course I think you would be suprised, as I was, at how intermingled the four breeds originally were. One of the best books that I found was Toy Dogs and their Ancestors by the Hon. Mrs. Neville Lytton. I think there are only a few copies around one being in the KC library. I was lucky enough to be lent one. According to this book you can trace the start of all toy spaniels back as far as Tibet and China in the 8th century BC. In various forms and crosses they travelled across Europe with Royalty and traders. 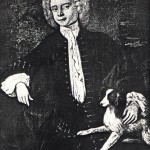 Someone called Buffon states that in 1750 England had Black spaniels called Gredius and he gave the name Pyrame to the ones that had Fire marks over the eyes, on the muzzle, throat and legs. This is one theory of where the B/T came from. 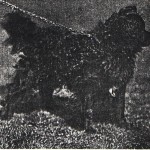 Another was that the B/T came from the Spanish Truffle dog or variety of water spaniel.This would account for the curly coat of the original B/T. According to research it has been proved that the toy spaniel was around for a couple of centuries before the Marlboroughspaniels from which the King Charles and the Cavalier are supposed to have evolved. 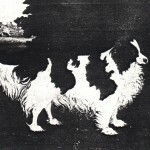 The probable original type kept by Marlborough was the Cocking or Springing spaniel, which were larger types. They were also longer in the body. They had the spot on the head, which is thought to have come from a cross with the white Holland spaniel, which had the spot, as early as 1500. 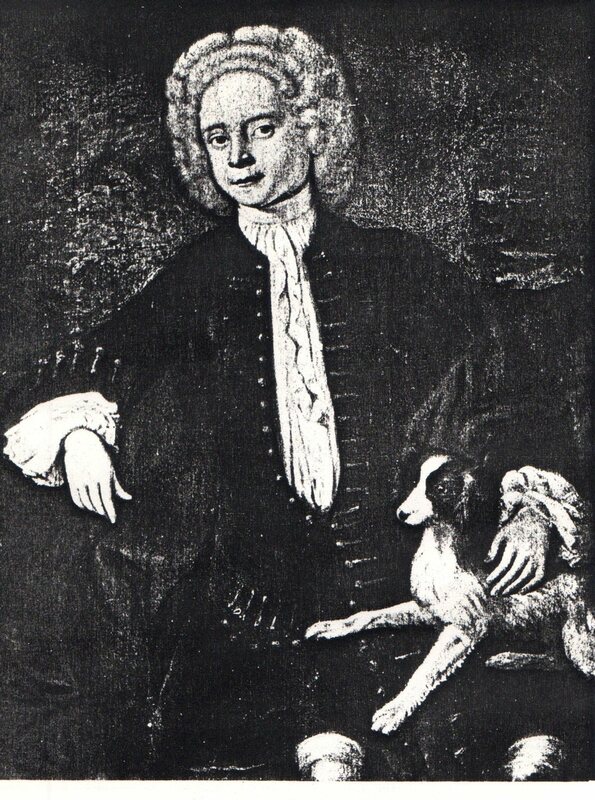 This was thought to account for the rareness of the spot in the short nosed spaniels and the prevalence in the longer nosed spaniels. There is still a small Welsh Springer, which nearly always has the spot. There were clearly two different sizes of spaniel in England at this time. 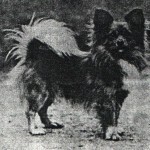 The true toy spaniel brought from the East via Europe and the Cocking and Springing (Marlborough) type. It would appear that these two were inter bred at some stage to produce the toy spaniel that we know today. It is also thought that Marlborough bred some smaller spaniels. These may have been the runts of the litter. They were called carpet spaniels. They may have been crossbred to produce the Blenheim spaniels that we know today. Some of these had the domed head and some had the flatter head that we know in the cavalier. 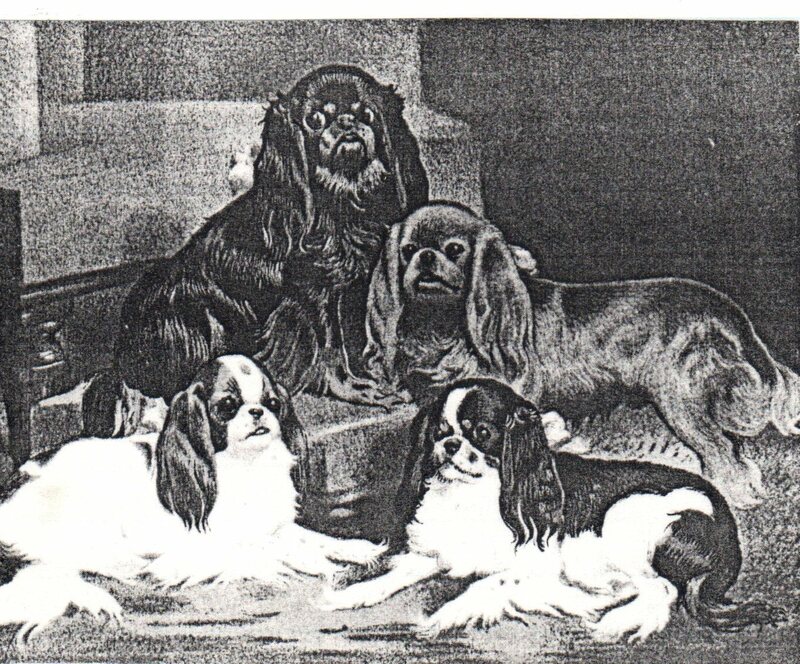 Having traced the toy spaniel back to Chinese times you can now look at the individual breeds to see how they then went on to become what we know today. This information came from a variety of places. The kennel club library was a vast source of information but it took a lot of finding. The old KC club magazines going back to 1911 and the Illustrated Kennel news back as far as 1910 were great sources of information and also Hutchins Popular and Illustrated Dog Encyclopaedia. One of the greatest sources was a great lady in papillons called Miss Clarice Waud. She had papers and articles going back many years. She has written books with Mark Hutchins about the papillon. It took about 9 months to get all the information on the four toy breeds. A labour of love! There is a theory that the first Chinese spaniels and the Peke originated from the Tibetan spaniel, which is thought to be one of the first Pure bred dogs of that time. If you see the early pictures of the Tibetan spaniel it has a very strong resemblance to the papillon in head and size. First a short summary of the development of the King Charles then after that the Cavalier.The original King Charles as has been shown is first referred to by Dr. Cains who was physician to Queen Elizabeth in 1570. These were either the Red and White, the Black and White Holland or the curly all black dogs. The Hon Mrs. Lytton chronicles in her book the development of the King Charles in seven stages. The Grendin. This was a type of cocker in England at that time. The Pyrame. These dogs came in two sizes. The larger dog was a sporting breed. 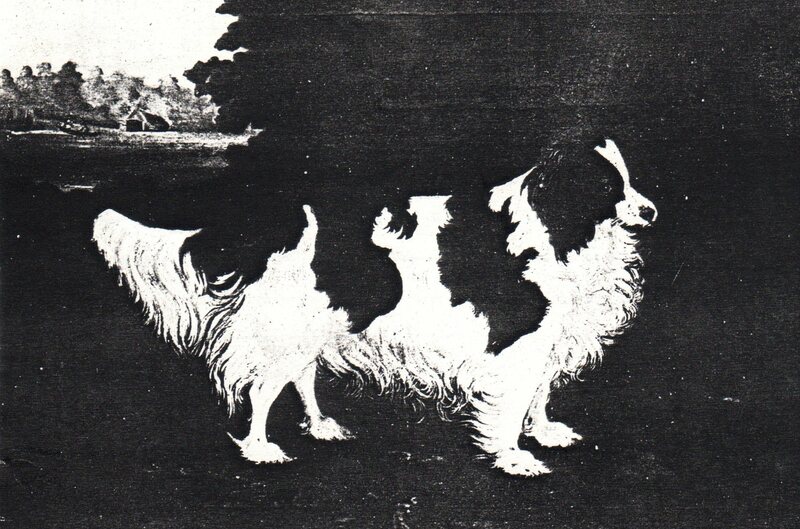 A variety of Grendin or cocker, and the smaller dwarf type of dog. 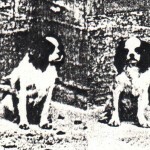 Both were GUN spaniels, Black and Tan or black and some times other colours. They had no feathering and short straggly hair on the ears. The curly King Charles. 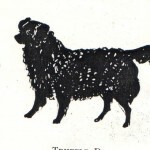 This was a black dog with white on the breast, probably connected with the small water spaniel and not the cocker. This was a separate breed. It had webbed feet and a short blunt nose. It also had a high domed head and a deep stop, curly coat and long feathering. The Truffle dog. This was closely akin to no.3 but came in all colours, though more often black and said to be of small French water spaniel or Poodle descent. 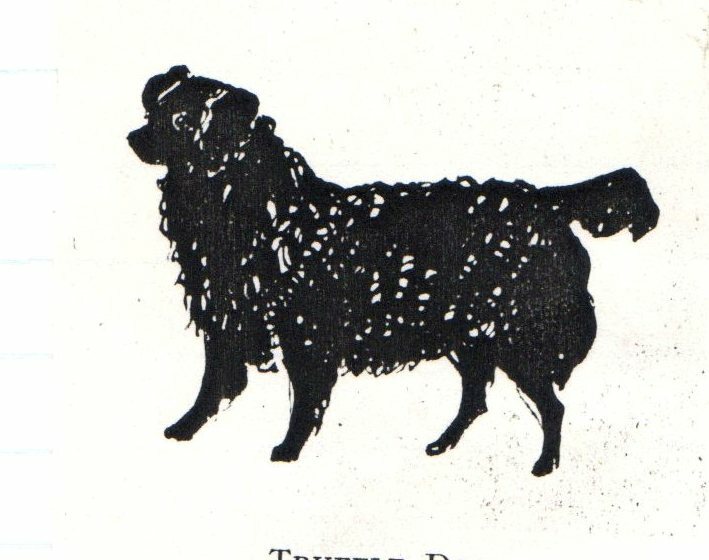 There was a Spanish import of the Truffle dog in King Charles I time which could have been the origin of the curly King Charles. The Duke of Norfolk Sussex Spaniel was next. This was a smaller curly B/T and possibly liver coloured dog. This maybe a cross between the Pyrame and the curly King Charles but larger. The Miniature Toy Trawler. 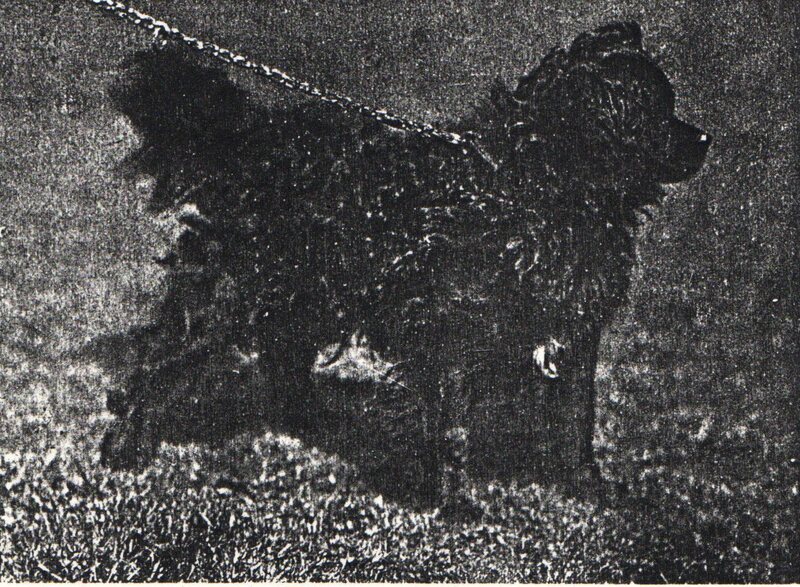 This was a more modern type of the old curly coated King Charles. The King Charles. The modern King Charles is thought to be a cross between the Pyrame and the curly King Charles and possibly a cross with the short nosed Pug or even, some think, with the bulldog to achieve the very short nose. The King Charles was all black until the introduction of the Pyrame in 1820. This cross with the toy spaniel gave the B/T. 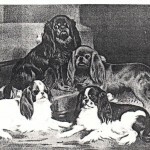 The Blenheim or red and white came from the Marlborough spaniels. The Tri is most probably from a crossing of all three colours e.g. the red and white, the black and white and the all black. 1828 sees the first mention of the Ruby through a Van Dyke painting of Phillipe Le Roy two hundred years earlier. This dog had white on its head and toes. The tri we know today is a result of crossing the B/T with the Blen. and putting the miss marked B/T back to the Blen. This then eventually bred a true Tri. The present day Ruby will most certainly have evolved the same way, being bred back to the B/T until the miss marks eventually bred true. 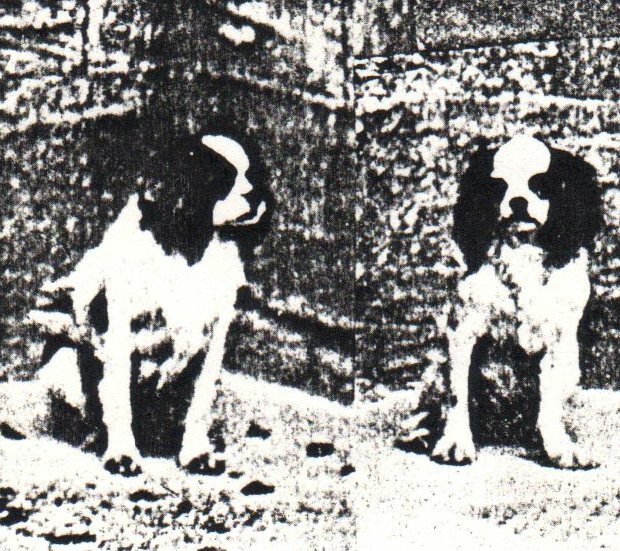 The short nosed type is first mentioned in 1845, and in 1859 “The Field” reports the King Charles and Blenheim spaniels as bred by the fanciers are snub nosed, round headed animals like Pugs with silky ears and coats, but they are truly graceful animals. They were originally Judged, in 1885, as four separate types. It was not until 1902 that it was decided that, as you could get all four colours in the same litter, they must all be of the same family. They were then judged all together under the name King Charles spaniel. The first standard was drawn up in 1885.